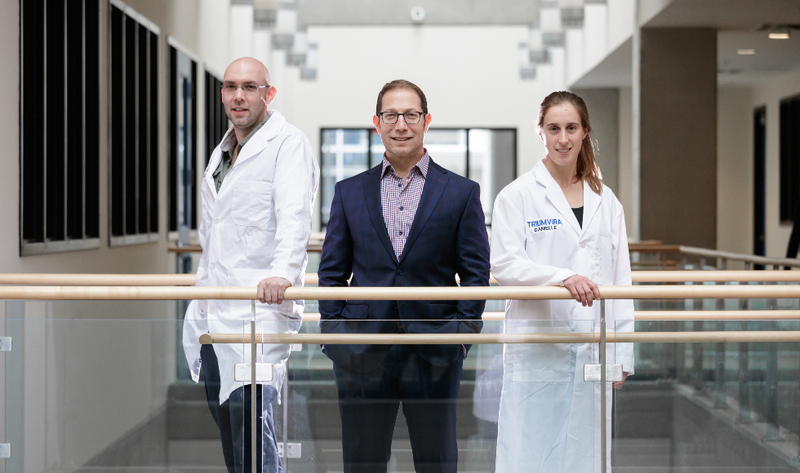 Jonathan Bramson, centre, co-founder and chief scientific officer of Triumvira Immunologics Inc., with Christopher Helsen, co-founder, director of R&D and head of platform development and Danielle Hayes, researcher in engineering and process development. Brian Lichty admits commercialization has not been easy. While he is one of the success stories of the Faculty of Health Sciences for moving research findings into business, he says there were several false starts, from an initial misunderstanding of the intellectual property process to obtaining adequate funding. Today, the company he helped found in 2015 is conducting three, soon to be four, phase I/II clinical trials in Canada and the United States, with promising early results developing cancer-fighting viruses. The company is also in talks with regulators in Europe, Australia and New Zealand about opening additional clinical trials. “What really compelled me to put in all this time and effort was, that on some level, if you keep doing your basic research, especially if you don’t file patents to protect some aspects of it, no one else can or will develop it further and patients will never benefit from it,” he said. 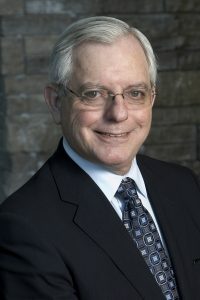 Brian Lichty, associate professor of pathology and molecular medicine at McMaster and senior vice-president of basic research for Turnstone Biologics. Lichty wears two hats, and that keeps his days busy. 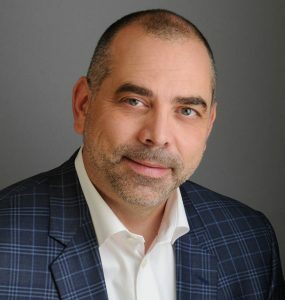 He holds the title of associate professor of pathology and molecular medicine at McMaster University, with limited teaching and research responsibilities due to his other time commitments. He is also the senior vice-president of basic research for Turnstone Biologics. The company is now based in Ottawa, New York and Hamilton. Officially, Turnstone Biologics is developing viral immunotherapies that drive benefit through simultaneous generation of targeted immune responses and modulation of the tumour environment. The global biopharmaceutical company was founded on research led by Lichty, John Bell of the Ottawa Hospital Research Institute and the University of Ottawa, and David Stojdl of the Children’s Hospital of Eastern Ontario and the University of Ottawa. Turnstone Biologics has raised $50 million in venture capital financing, brought in more than $100 million in non-dilutive funding, and received numerous biotechnology industry awards. The company has grown to 70 employees in New York, Ottawa and Hamilton. There are 15 staff members at McMaster who will be in their newly-renovated rented lab space in the McMaster University Medical Centre by January 2019. “We’re actually treating people and that was the whole point of this, however, we’re not there yet,” Lichty said. “Each trial is phase I, so it’s still early. However, we are starting to see some positive signals. Gay Yuyitung, executive director of the McMaster Industry Liaison Office (MILO), cites Turnstone Biologics as a prime example of a best-case-scenario commercialization story at the university. 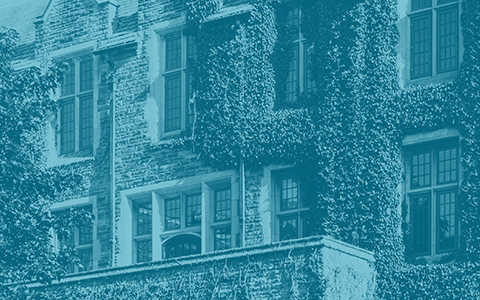 MILO supports the research endeavors of McMaster and its affiliated academic hospitals by facilitating collaborative research with industry partners and disseminating research results through commercialization. “We’re here primarily to serve our faculty, staff and students to identify what is patentable, who may be interested in taking it to the next step, and to connect with those looking to sponsor research or collaborate with the university,” said Yuyitung, who has been with MILO for 16 years. Over the past five years, more than 200 patent applications were filed by MILO on behalf of inventors in the Faculty of Health Sciences. The university has a joint intellectual property policy that outlines that revenue is divided equally between the university and the inventor. Revenues generated from licenses in the past five years, including copyright, were $22.5 million for the whole university, with $11.7 million distributed to inventors. Gay Yuyitung, left, executive director of the McMaster Industry Liaison Office (MILO), speaks with researcher Sheila Singh. Photo by Ron Scheffler. Another success story for McMaster is the licensing of quality of life questionnaires. These questionnaires are considered reliable tools to measure quality of life in various patient groups for a variety of conditions, and licensed by pharmaceutical companies, as well as academic and health institutions. Yuyitung said that, in her experience, inventors are driven to see their research being used and making an impact. However, she said, there are also additional benefits. She said the advantages ­­of commercialization are the same for the university. According to Statistics Canada, the main reason businesses fail is inexperienced management. Yuyitung agreed this is a major obstacle. Bill Orovan, vice-dean of clinical service and commercial enterprises for the Faculty of Health Sciences, said that there has always been some commercialization activity taking place in the Faculty, but its nature has changed over the years. Bill Orovan, vice-dean of clinical services and commercial enterprises at McMaster’s Faculty of Health Sciences. “In the past, researchers would get to the proof of concept stage and outside forces would pick it up and do the work to commercialize it,” he said. “Those places don’t really exist today and drug companies aren’t interested in doing it anymore, so it has fallen on universities to do a better job of commercializing their own discoveries. Orovan said that as a result, universities across Canada have frameworks in place to help facilitate this new world order of commercialization, creating on-campus offices and growing philanthropy. “The problem with commercializing medicine and health sciences is that there are huge barriers to entry that are time-consuming and expensive, and people have had to depend on their own resources and the bank of mom and dad, in some cases, to afford to make these things happen,” he said. In an effort to ensure the Faculty is making the most of its research commercialization opportunities, Bloom Burton & Co has been retained. The Toronto-based investment banking and advisory firm identifies, cultivates and creates investment opportunities in the health-care sector, on behalf of companies and investors. 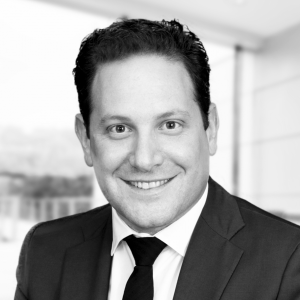 Brian Bloom, chairman and CEO of Bloom Burton & Co.
Bloom said that while academic institutions are good at research, the same cannot be said when it comes to commercialization. “There is great academic research being done around at the world at top institutions like McMaster, but the majority seem to be challenged when it comes to commercialization, and we are trying to change this,” said Bloom, a recipient of the 2017 McMaster University Distinguished Alumni Award for Science. Bloom noted only a small percentage of research in academia has commercial value. He said his team has identified about a dozen opportunities at McMaster in the past three years. Jonathan Bramson, vice-dean of research for the Faculty of Health Sciences, said there is a divide between academic institutions and the private sector. “The whole idea of commercialization and the academic world is really a case of two solitudes not talking to each other, and making assumption of what the other side is doing,” he said. Bramson said the lack of commercialization activity by many academic researchers is largely based on a lack of understanding. Some, he said, think it is an easier way to acquire funding than winning a research grant. Still others, he added, see it as posing potential ethical dilemmas when it comes to getting involved with ‘Big Pharma’. Both are incorrect, he said. “Most academics do not understand the value of commercialization because they have not been exposed to the private sector,” said Bramson, professor of pathology and molecular medicine. “Their entire careers are spent in academia, so this isn’t a surprise. Bramson knows because he has been there. He, Christopher Helsen and Bloom Burton partnered to create an immunotherapy company in 2015 called Triumvira Immunologics Inc. The company’s vision is to develop new T-cell therapies that are safer and more effective than current cancer treatments. 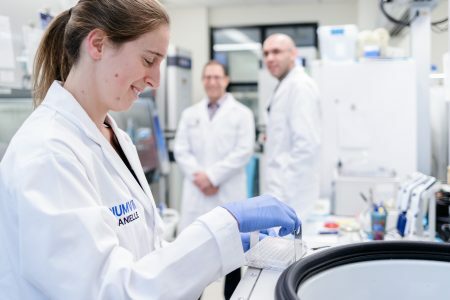 Danielle Hayes, researcher in engineering and process development with Triumvira Immunologics Inc., prepares a vessel containing engineered cells for a high-speed spin. Photo by Ron Scheffler. “The more I learn about commercialization, the more I can tell others and dispel the myths,” Bramson said. “The biggest thing I have learned is patience. Always be patient and learn the difference between driving your agenda and pushing your agenda. They aren’t the same. Bramson said while it is important to get research from the bench to the bedside, he noted it should be an avenue, rather than the end all and be all, for researchers at McMaster. “I don’t want our outstanding basic and clinical scientists to change what they do – they are fantastic,” he said. This story originally appeared in the winter 2019 edition of the Faculty of Health Science’s magazine, Network.